Seattle Pacific University alumni came from as far as Issaquah and Indiana, and North Bend and Nevada, for Homecoming 2014 — and as always, campus came alive with nostalgia and bright spirits. Cheering Falcon fans set a triumphant tone for the men’s Homecoming basketball game, which ended in a 79–47 victory over Western Oregon. 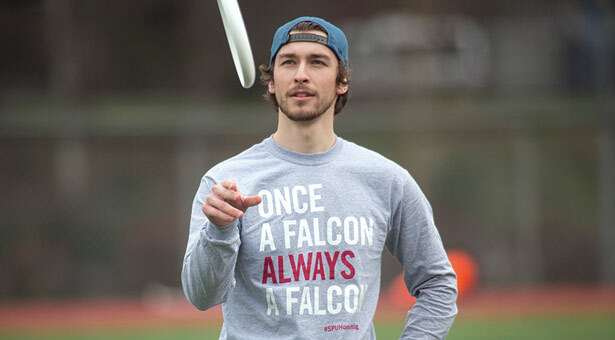 On a sunny Wallace Field, young alumni faced off against current students in an Ultimate Frisbee match, defending their title as reigning champs. And SPU President Dan Martin welcomed more than 200 alumni, faculty, staff, and friends to the annual Homecoming Luncheon celebrating the 2014 Young Alumnus of the Year, Char Beck ’08, and five Medallion Award winners. Medallion Award honorees Jim Lyon ’74, Michele Weslander Quaid ’91, Mike Quinn ’85, and Bob Ekblad ’82 and Gracie Johnson Ekblad ’82, reflected on the significance of friendships made at SPU, and the impact of faculty mentorship. “It was from this place that I believed I could go and do right in the world,” said Lyon. Classes ending in “4” and “9” gathered to reconnect and share updates on life since crossing the Commencement platform. Business, theology, education, and nursing graduates shared special reunions, as did Centurions, Falconettes, KSPU staffers, and ASSP and STUB leaders. The SPU Theatre Department production of The Miracle Worker and the Homecoming Talent Show featured stellar student performances.